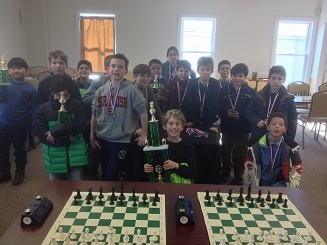 This month’s K-8 Scholastic Championships was once again sold out. Four players finished tied for first in the K-2 section. 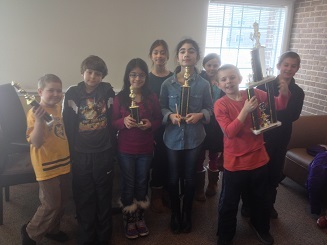 Redmond Little, Ved Bathula, Nico Stefanoni and Laurel Aronian were today’s co-champions! Jason Lessing finished with the only perfect score of the day. 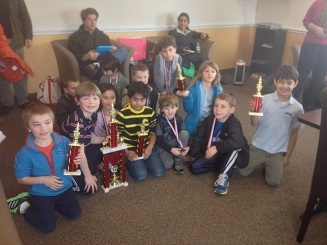 Jason won all of his games to pick up nearly 150 rating points and take home first place trophy in the K-5 section. Dillon Hurst, Sean Thomas and Joseph Ho all finished a point behind tied for second. There was also a massive tie for first in the K-8 section. Nathaniel Moor, Anna Argulian and Brent McCreesh all finished with ¾. Ambika Grover, Robert Ulmer and Emma Strauss finished just behind with 2/4 each.